Some people like to be all positive and uplifting and take some time to center and think about things that make them happy. I am not that person. When I take some time to center, I either fall asleep or spend several hours looking at flashmob videos on YouTube. I need a little vim and vigor in my life, and getting in touch with my anger is a good thing. So now, may I present a few things that really get my goat. Here are a few that are buzzing around in this crazy bonnet of mine. I am trying to be a good mom, the kind that the kids don't say later "Remember when mom put the aluminum pots in the dishwasher and then later we all got Alzheimers? No?" So there are dishes that don't go in the dishwasher. 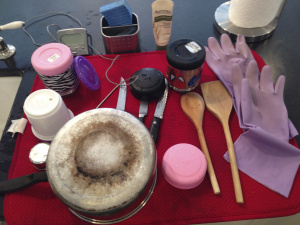 Plastic measuring cups, aluminum pots, and the like. I know what you're thinking. Just get rid of those things, they're going to kill you with some awful disease no one should get. Frankly, I can't keep up with all the terrible damage I'm doing with normal household items, so my plan is to expose everyone to enough things that they get the Three Stooges Syndrome like Monty Burns (you can read more about that here). When we moved into this house, we lovingly renovated it to contain lots of bathrooms with an embarrassing amount of places to hang towels. With three daughters and a son with shaggy hair, we do go through a LOT of towels. But they never. get. hung. up. It's like they think someone will come behind them and pick up the towels or something. My grandmother actually had a little device that you could feed the toothpaste tube into with a little crank on the side so that you would neatly extract every bit of toothpaste out of said tube. I don't want to say that she's cranking around and around in her grave, but I know the state of our toothpaste tube would make her really mad. Something about how the tube twists at odd angles and perfectly good blobs of toothpaste are trapped in a no-man's land three quarters of the way down the tube makes me grind my teeth. 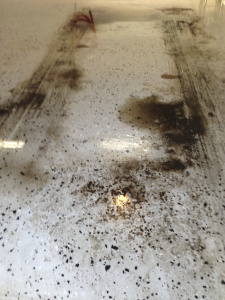 OMFG I only took the car out once since the floor was last cleaned (by my husband, full disclosure) and now it looks like a New York City gutter in late march after 1,000 soot-spewing buses clipped the curb. It's crazy! I hate winter garage floor! It's slipperier than a sheet of ice and things inevitably fall in the dirty moat of melted slow that encircles our car. Things like a homework page or that last bit of lunch someone was finishing in the car. And then it's a swollen apple core marinating in a stew of forgotten vocabulary words. My eye just started twitching. And then there's this picture. 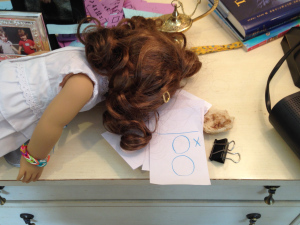 Did the American Girl Doll pass out after too much bread and multiplication? Should I start CPR? Just, why?